Our Trixi® 'Ayers Rock' Flower Combination features three different flowering annuals, all in contrasting colors and all with unique blossoms. 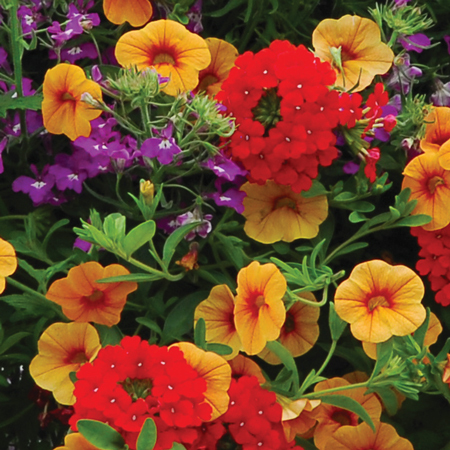 The designer combination of MiniFamous™ Tangerine Calibrachoa, Fuego™ Bright Red Verbena and Magadi™ Basket Dark Purple Lobelia are fantastically flirty, while the mélange of flowers is nothing short of genius. Ayers Rock is a colorful and world famous sandstone rock formation in Australia; these colors are representative of the beauty of that magical place. Our 'Trixi Ayers Rock' plants are grown and shipped in fine quality growing medium and are guaranteed to arrive alive and ready to thrive. "Very Nice Ayers Rock Trixi Combination"
Comment: This Flowering Combination arrived very well packed with the plants growing nicely. 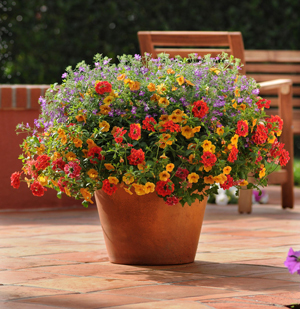 Comment: Pretty combination, bright colors, has shown some growth with sunlight and fertilizer in just one week. Comment: One plant to plant all the color you need, I love this concept!! !